Frock Off Book is Fantastic! Frock Off Book by Jo Dibblee is Fantastic! Have you ever read The Glass Castle by Jeanette Walls? 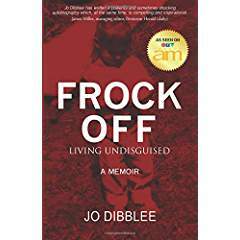 If so, then I think you will LOVE this memoir by Jo Dibblee: Frock-Off; Living Undisguised. If you haven’t read The Glass Castle but enjoy reading a candid memoir that doesn’t hold back from telling the truth, then I highly recommend Frock-Off. With humour and hope, Jo shares the harrowing rollercoaster of her life story and gives the low-down on frocking – how she learned it and used it to survive, how she found it holding her back and what she had to do, once and for all: Frock OFF. Despite harsh truths, brushes with death and agonizing betrayals, Jo’s heart shines through these pages, offering promise, wisdom and inspiration to any reader who has learned to hide and longs to be free. Quite frankly, it is a miracle Jo physically survived her unbelievable childhood – let alone learned to thrive in the way she has. But she certainly has…and continues to be an inspiration to many – both because of who she is AND what she does. I first crossed paths with Jo Dibblee in 2008, when I was speaking at a women’s networking event in Alberta. Then we went our separate ways. Eight years later, our paths crossed again at a different event in British Columbia – and I was astounded to hear about Jo’s story. So I immediately ordered her book. Despite of all that she has been through – or perhaps because of all that she has been through – Jo is unstoppable in her commitment to empowering women to reach their highest potential. I am very honoured to know her AND to have spoken at two of her Frock-Off events. To “frock-off” means to shed whatever it is that is holding us back in life. Our “frocks” can be the lies we tell ourselves – or they can be the truths from our past that are no longer serving us. Our frocks can be our stories, our excuses, our embarrassments, our habits, our coping mechanisms, our fears, our circumstances, our limiting beliefs. Maryanne, this resonated a bit with me because my mother was both mother and father to her four children since I was two and a half. My father smoked two packs of cigarettes a day and was an abusive drinker! I have no memory of him. What I do have memories of is a mother who made sure we had everything we needed, and for her I never regretted having a father in the home. My mom is as strong as any man and also nurturing, diplomatic and knows how to set goals. She shared her life with her children though, in the form of stories. My vivid imagination is no match for her vivid memory (which I hope she never loses) and she can recall the day each of her children were born and what the first garments she put on us were. And yes, my father’s flaws (she has told me) has shaped my perspective. June 1st is my Dad’s birthday. He’s 82. The above photo was taken a few days ago in Linden, Alberta, at the nursing home where he now lives. 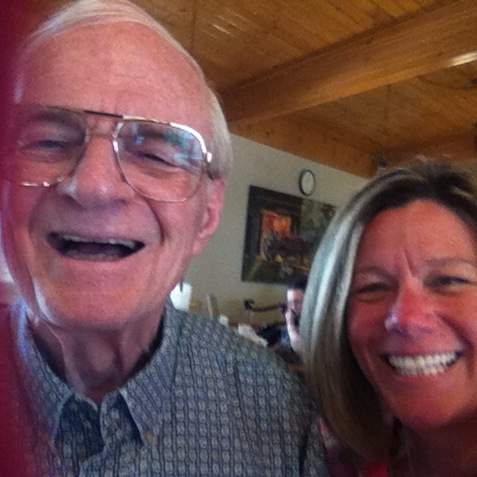 My Dad has dementia, so his short term memory – and much of his long term memory – is pretty much shot. But there are plenty of lucid moments in which, when prompted, he’ll break into an old song or recite a poem…or even speak in Old English. His astounding vocabulary and eloquent manner of speech is still in tact, much to the delight of all of us. My Dad was a brilliant man and had many excellent qualities. But he was a drinker and my parents divorced when I was 6. After that, I only saw him a couple of hours a week. Thankfully, I had a Mom who more than made up for what my Dad couldn’t provide as a parent. I suspect I’m not alone. But the older I get, the more I realize that all that my Dad was able to give me – including the lessons learned from his flaws – is paying off in spades. If you’d like to read the blog I wrote about my Dad for Father’s Day last year, here’s the link: When the Engine Light is Red. Maryanne Pope is the author of A Widow’s Awakening and the playwright of Saviour. She is the CEO of Pink Gazelle Productions and the Chair of the John Petropoulos Memorial Fund. If you would like to receive Maryanne’s Weekly Words of Wisdom blog, please sign up here. Next week’s Mothering Matters blog, I Went From Wanting Children to Living Happily Childless, is by Nina Steele, founder of nonparents.com. Nina writes candidly about her experience of not being able to conceive due to her husband’s infertility – and the tremendous cultural pressure they faced due to their African heritage. Getting to the Heart of the Matter: To Be or Not To Be…a Mom? To subscribe to Mothering Matters, here is the link.